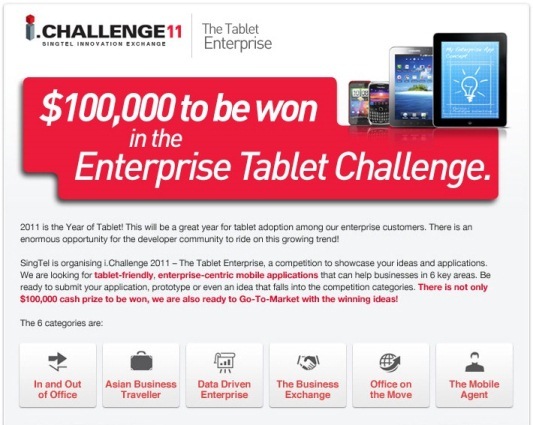 Leading regional telecommunications provider SingTel today kickstarted i.Challenge 2011, an annual competition for app developers. The theme this year is “The Tablet Enterprise”, and will focus on applications that are tablet-friendly – iPads, Blackberry Playbooks, or Android-based devices – and helps address issues for enterprise customers. There are six different categories that app developers can compete in. Finalists and winners of this competition stand to win cash prizes and also opportunities to market these their applications to SingTel‘s base of consumer and enterprise customers. Visit i.Challenge 2011 to find out more.